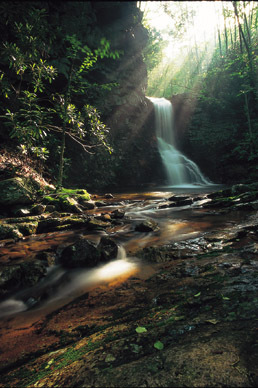 Johnson County has more stream miles of wild trout water than other county in East Tennessee! Native Southern Appalachian Brook Trout, lake run rainbows, and monster brown trout are right down the road. DON'T BUY THE NAME, BUY THE BEST !! We're just minutes away from the best flyfishing in the South. If it's tailwaters you like, try the Watauga or South Holston Rivers. There are hundreds of miles of mountain streams in East TN and Western NC. Stop by and we'll show you where to go to find the action !! 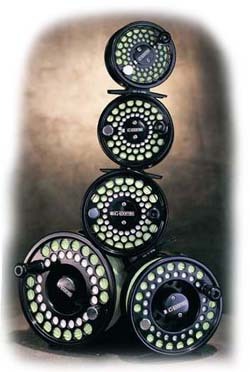 G-Loomis is the standard by which all other fly rod manufacturers are imitating. The Streamdance GLX and Metolius series both feature all the responsive action and flexibility every flyfisherman dreams about. Ultralight tippets are mandatory on our local tailwaters, so you'll need responsiveness to match. The Streamdance series offers everything you'll need, and the extra length for casting from a sitting position in a pontoon boat. Striped bass in Boone Lake and Holston River can often exceed 30-40 pounds. Be ready for anything with the 10 foot 8 weight GLX Series. G-Loomis Syncrotech fly reels are machined from a solid bar of aerospace grade 6061 t-6 aluminum for the ultimate in strength and light weight. They are polished and anodized to a mirror finish that's as beautiful as it is bulletproof. Mountain Stream, Tailwater, Smallmouth Bass, and Reservoir Fly Patterns- Locally Tied with 35 Years Experience Only $ 1.75 each !! Buy it here and we'll set it up for free, including basic casting/fishing instruction.